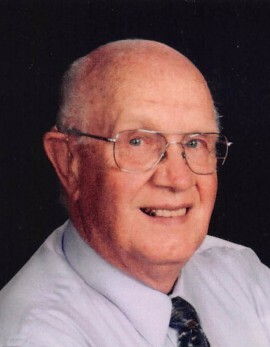 Vernon Arnold Johnson, 89, Miltona, formerly of Evansville, died Tuesday, March 26, 2019 at Knute Nelson, Alexandria, Minnesota. Vern was born March 14, 1930 to Algot and Myrtle (Anderson) Johnson in Iron River, Michigan. His family moved to a farm near Hoffman, Minnesota in 1941. He graduated from Hoffman High School in 1948. He then attended Spartan College of Aeronautical Engineering in Tulsa, Oklahoma and graduated in 1950, majoring in airline maintenance engineering. He married Gunhild Johnson on April 30, 1954 in Hoffman, Minnesota. To this union was born four children: Mary Catherine, Vernon Erick, Steven Mikkel and Sonja Kay. Vern began a life of service in 1951 when he enlisted in the U.S. Air Force as a Private and retired in 1971 as a Command Pilot with the rank of Major. He was awarded 18 citations headed by the Distinguished Flying Cross with one Oak Leaf Cluster, the Air Medal with five Oak Leaf Clusters and the Air Force Commendation Medal. He flew a jet fighter bomber aircraft during his tour in Korea and spent a year in Iceland as an Intercept Director in supporting the air defense mission. He flew scores of missions in the Cuban Crises and 146 combat missions during two tours in the Vietnam War. He served as Pack Chairman when his sons were participating in the Cub Scout program of the Boy Scouts of America while stationed in South Carolina. After retiring from the Air Force in 1971, he served as local assessor for three townships and one city in Douglas County, Minnesota until he was appointed as County Assessor of Grant County, Minnesota in 1979. He was a member of the Board of Directors of the Minnesota Association of Assessing Officers for six years and served as President of this state association in 1990. He retired from this county position in 1994 after serving for 15 years. Vern served the City of Evansville, Minnesota as Mayor and Dog Catcher for three terms. He was very active in his church where he served as Sunday School teacher, Sunday School Superintendent, Choir Director and a number of terms as president of the congregation. He also sang in the church choir for many years. He was also active in his community. He served as leader of the local 4-H Club and coached a state winning barbershop quartet in the local 4-H Club and local FFA. He was a member of the Evansville Arts Coalition and served as Treasurer of and Director on the Board of Directors of the Evansville Historical Foundation. He also served as Historian and Assistant Treasurer of the local American Legion Post. Vern had a number of hobbies, some of which were golfing, fishing, music and crocheting. Friends, relatives and neighbors received afghans, potholders, stocking caps and mittens. Many newborns in the community were recipients of a pair of booties. He is survived by his four children: Mary (Don) Breding of La Crescenta, CA, Erick (Diane) Johnson of Yorktown, VA, Steven (former spouse Laurie) Johnson of Miltona, MN and Sonja (Michael) Endreson of Montrose, CO; 9 grandchildren: Aaron Breding, Christopher (Kyna), Benjamin (Melissa), Nicolas (Addie), Caleb (Cassandra) Endreson, Nathan Johnson, Maiah (Kevin) McNeil, Derek (Emily) Johnson and Melissa (Jay) Swanson and 8 great-grandchildren. He is also survived by his sister, Arlys Johnson of Prior Lake, MN, nieces and nephews. He was preceded in death by his parents, Algot and Myrtle, his brother Dwaine and former spouse Gunny, February 14, 2019. Memorial donations may be made to Knute-Nelson: 420 12th Ave. East, Alexandria, MN 56308, Evansville Historical Foundation, Faith Lutheran Scholarship Fund or Evansville Senior Center. Funeral Services: 11 AM, Saturday, March 30, Faith Lutheran Church, visitation one hour prior to the service.